The Governor of Arunachal Pradesh Brig. (Dr.) B.D. Mishra (Retd.) participated in the first day of the two-day 67thPlenary of North East Council (NEC) at Shillong on Monday. 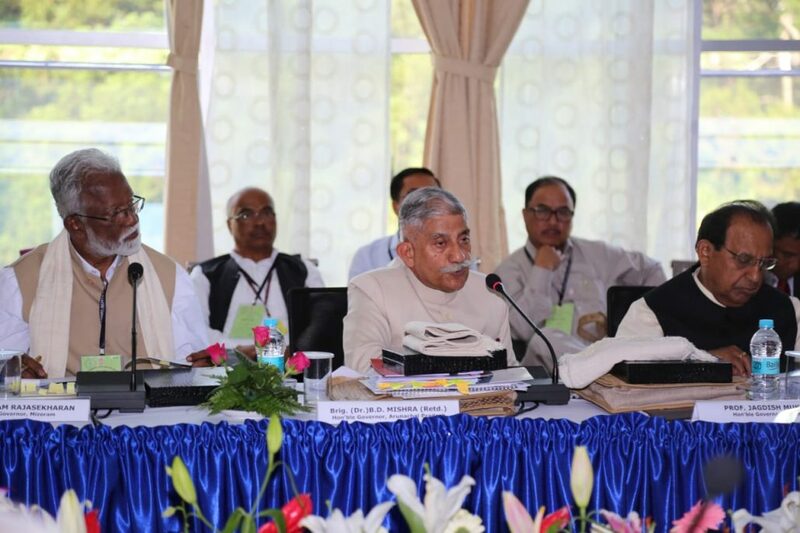 Addressing the Governors and Chief Ministers of eight North Eastern States, chaired by the Union Home Minister Raj Nath Singh, the Governor highlighted the potentials and challenges of Arunachal Pradesh. He also put forward the connectivity bottleneck and implementation of 1500 km Trans Arunachal Highway, Arunachal Frontier Highway and East West Corridor. He said that Arunachal Pradesh is the lone State which does not have an airport and emphasized that Civil Aviation Ministry and Ministry of DoNER must fund this important project at the earliest. The Governor requested the North East Council and Ministry of Development of North Eastern region (DoNER) for their participation in tourism, skill development, health care and education. Stating that Arunachal Pradesh is most strategically located in the country, having 1680 km International Border with three countries i.e. Bhutan (160 Km), China (1080 Km) and Myanmar (440 Km), the Governor said that the Border Area Development in the State is a necessity for security and to check thinning out of population. The nation has to invest in the Border Areas so that people of the State are safe and the far-flung land has men & women to fly the National flag. He informed the house that Arunachal Pradesh Government has submitted a BADP and it would need additional package under the programme. To boost the education sector in the State, the Governor urged NEC to explore the possibility of establishment of regional important educational institution in Arunachal Pradesh in the same lines as IITs and IIMs. He also urged the NEC to open a strategic policy research cell in Rajiv Gandhi University, Doimukh, which can deal with border related issues across the North Eastern region on the same line of the APJ Abdul Kalam Centre for Policy Research and Analysis set up by NEC in IIM Shillong.